Smart Home Using MIPv6 is the Integration of Technology and services for better quality of living.This paper provides a review of the recent Developments,Technology,Architecture,Application and future scope for Smart Homes with the tremendous help of MIPv6.The principles of MIPv6 are included for mobility on the design of the architecture for MIPv6 based Smart Homes. Smart Homes based on Mobile IPv6 Consists of various techniques and Home Networking for Interactive services. The crucial Advantages of Smart Home is to support and improve the quality of life for disabled and elderly people. Nowdays vigorous increase in the use of computer technology in the term of devices are introduced in our society , which we use everyday.Smart Home is also a outcome of this thought with integration of technology.A boundary that defines what a Smart Home is must first be established.A Smart Home is an environment,it may be any place office,house,apartment where appliances within that environment are networked to each other by integration various technology,processors sensors .These networked appliances must aim to meet the residants basic demands on their living space.It should provide Health care ,environment monitoring such as heating,ventilation ,security and operation of technical equipment should be more convenient and almost invisible to the resident.This vision can also be extended where conventional devices like medicine cabinet ,doors,curtains,carpets can also be made Smart included as functional pieces of Smart Home automation using MIPv6. The first and formost function of the Smart Home is to adapt automatically the needs of residents and provide help according to need and daily routine with greater convenience and safety and concern with energy conservation.The Smart Home growing interst due to the need to enable elder care for disabled individuals. Smart Homes are also known as Intelligent Homes or Interactive Homes.It helps to control various Mechanical Appliances , celluar or Internet using IPv6.Smart Home Technology is a way for electronics appliances,consumers to Communicate with each other.It uses the existing technology for Smart devices by installing computers with advanced functionality using DSL,Bluetooth and wireless Technology.These technology provides the way to have a home network for devices to communicate with each other using Internet.It is Application of Ubiquitous computing and remote access control. We have used MIPv6 due to tremendous advantages like more efficient Routing,efficient packet processing ,directed data flows,simplified network configuration,support for new services and security majors. The different Technologies that can provide platform for Smart Home Automation are X10, INSTEON,Zigbee and Z-wave. X10 is an early home automation technology that was developed by Pico electronics of Glenrothes in Scotland back in 1975.X10 is an open protocol for communication among home automation devices that primarily uses mains wiring for signalling and control.It allows compatible products to talk to each other using the existing wiring in the Home.Most X10 compatible products are very affordable and the fact that they talk over existing wires in home means that no rewiring is required. It is very simple, a transmitter plugs in at one location in the home and sends its control signal to a receiver which plugs into another location in the home. X10 wired or wireless protocol packets consist of a four bit House code followed by one or more four bit Unit codes and then a four bit Command . Different House code often need to be used within the same home to generate enough distinct X10 addresses and so they are usually not available to help distinguish one X10 house installation from a neighbouring one. Smart Home products together with X10 are Leviten,Stanley,IBM,JDS,ACT,Homepro etc. Zigbee protocol (IEEE 802.15.4) was engineered by the ZigBee Alliance.It is a wireless communication standard based on a standard network architecture.ZigBee devices are designed to communicate via radio frequencies. It has adopted 2.4 GHz for it’s world wide standard frequencies.ZigBee devices are of 3 types ,Coordinator,Routers,and End Devices.Coordinator control the network formation and security.Routers pass on the signal and extend the network range.End Devices perform specific tasks such as turning on a light.ZigBee Home Automation offers a global standard for interoperable products enabling smart homes that can control appliances,lighting,environment,energy management and security as well as expand to connect with other ZigBee networks. Z-Wave is a mesh networking technology developed in 1999 to create a standard for wireless Radio frequency communication for home devices . INSTEON the most reliable home automation technology is based on dual-mesh network.Dual means that INSTEON uses both radio frequency and home’s existing electrical wiring to talk to each other .Every message is confirmed as it is received and if any errors are detected,the message is automatically resent.Unlike all other mesh networks,INSTEON mesh network has every device acting as a repeater,receiving and sending devices on the network so instead of stressing the network by adding more INSTEON devices,you actually strengthen it. Some equipments can work with apeer to peer network setup, but is on applicable to home equipments that uses same protocols.Thus,a home gateway is enabled as a service gateway ,translating between different protocols for appliances.Based on aboved defined technology Smart Home can be described as a integration of technology and services through home networking for a provision of a better quality of living.The traditional setup for Smart Homes is enhanced by providing mobility utilizing the principles of MIPv6. 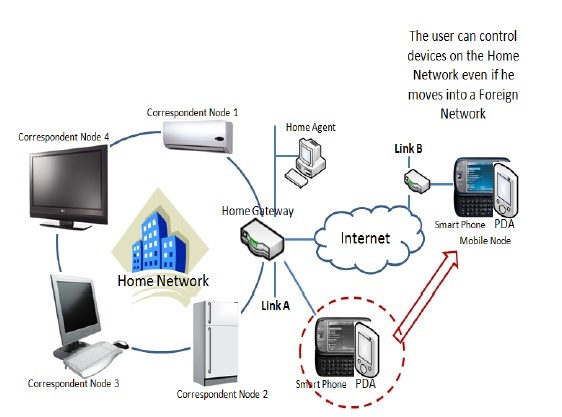 Above figure shows that user can still control the home appliances or equipments connected to the home network even if he moves into a foreign network.When the user is away from the home network ,the users mobile phone or PDA is associated with a care-of-address which identify its current location. Mobile IPv6 is a version of mobile IP that allows users with mobile devices whose IP addresses are associted with one network to stay connected when moving to a network with a different IP address. Projects which are currently working in this area are General Electric Smart Hosignedme, MIT Intelligent Room,TCU Smart Home,& Microsoft easy living. General Electric Smart Home In this project the appliances control interfaces are designed for climate control and light control functionalities. Energy management devices are also inbuilt. Security systems are also designed to avoid and alert from any unusual activity. MIT Intelligent Room The project is based on technologies for an intelligent Room. Rather than pull people into the virtual world of computer the project is trying to pull the computer out into the real world of people. It combines robotics and vision technology with speech understanding to provide ready-at-hand computation and information services for people engaged in day-to-day activities. TCU Smart Home This project is based smart technologies like inhabitant prediction and smart entertainment control. Microsoft easy living The project is based on camera-based person detection and tracking of people if they pass into the room. Biometric authentication is used for valid verification. Distributed systems are used for synchronisation of appliances which are interconnected to form a smarter technology. Ubiquitous computing is also known as pervasive computing is the result of computer technology advancing at exponential speed ,a trend towards some man-made products and some natural products having hardware and software. The most heard about the Smart technologies are that of kitchen appliances.Devices such as Refrigerators, Microwaves, Coffeemakers and Dish Washers will use this technology.Whenever someone wants to have a snack but does not feel like making something , why not have the refrigerator to suggest something based on what it has inside ofIt.Not only it would communicate with microwave to prepare the cooking power and Time for that particular dish.Smart Home Technology will be used in many electronics devices in the near future and it is a form of technology that will prove to make life easier in Ways and more entertaining.Current example of Smart Refrigerator for Smart Homes are developed by LG Electronics. Intelligent Vehicles Environment which is capable of Location-aware navigation systems,task-specific navigation,traffic-awareness and Intelligent Environments which handle optimized climate and light control,item tracking and automated ordering for food and general use items,automated alarm schedules to match inhabitants preferences,control of media system etc are examples of Smart Home. Home Automation , Health monitoring and decision making are the main features which will be the part and parcel of near future in the smart phones.Smart Homes will contain multiple,connected devices such as: appliances;control actuators;personal health and home-environment sensors ,entertainment console and displays. Data from these devices can be exchange easily in support of a range of Smart Home services.Examples include local and remote home energy management,security monitoring,wellness monitoring and also the sharing of Internet and entertainment content. These services make the lives of householders easier,as individuals gain finer control over there environment by accessing a variety of context and situation-aware application. The Idea of Smart Homes is exciting.In simple terms and Smart Phones provides superior comfort, convienience, security and energy saving through intelligent control using the electric devices, Networks and Mobile IPv6. Concluding we believe that the future in home automation using MIPv6 is towards the Internet. Web technologies have the potential to become the future standards in Smart Home environments towards an interoperable and sustainable. The goal of Smart Homes using MIPv6 is to be integrated into every facet of an individual’s life,resulting in the culmination of the technology into the home environment and effectively creating a Smart Home where all user needs are anticipated and cared for . We hope that through our effort Smart Home is no longer an conceptual topic but will be applicable to anyone’s home and being adopted in anyone’s living style . So we can say that Smart Home is a living space saturated with computing and communication,yet gracefully integrated with human occupants and visitors. . So we can say that Smart Home is a living space saturated with computing and communication, yet gracefully integrated with human occupants and visitors.
. Kenneth Wacks, Home Automation and Utility Consumer Services, Cutter Info. Corp., MA,1997.
. Rosslin John Robles and Tai-hoon Kim, Applications, Systems and Methods in Smart Home Technology: A Review, International Journal of Advanced Science and Technology, Vol. 15, (2010) February, pp. 37-48.
. Venndardela Redriksson, "What is a Smart Home or Building", (2011) April.